This go around we are introduced to the world of Death and his acceptance of the apprentice Mort. Death really wants a day off. Mort has no hopes of a job in his local village as he is made from all knees. Death's strong desire to take a holiday leaves the world with an extremely morphing Mort. In the interim of a human apprentice filling Death's duty, Mort decides to save the girl he loves (though he has never actually met her). What happens to the world when Death gets be the judge not the bailiff? Things get a little sideways. And there is a showdown. We also get to meet Ysabell, Albert, and Binky. We again enjoy the world of magic and prophecy with the lovable Rincewind. This time he must attack the issue of the eighth son of an eighth son of an eighth son. And why wizards are really encouraged to live there lives cooped up in the university. Rincewind, to never be left alone on a quest, manages to acquire Conina and Nijel (some wonderfully rag-tag barbarians) during his travels. We also get a lovely glimpse of the ever-enduring Luggage as well. This one had some lovely themes on making our own choices versus being dominated by an authority figure. 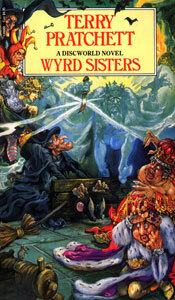 Back again to the world of women's magic and Granny Weatherwax. Granny has become a part of a coven back in the Ramtops. We get to experience some more of Nanny Ogg's hedgehog gold and are introduced to Magrat Garlick. Granny's apprentice Eskarina has vanished without a trace, so she must be fitting in nicely at the university. Pratchett must really have been going through a Shakespeare phase because the entire story is very Macbeth-ian (and even has a troupe of travelling thespians as main characters). There are also allusions to the bard's personal life and other of his greater works. 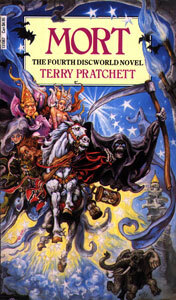 This is not one of my top Discworld novels, but I have endeavored to read the whole kit and caboodle in order.